Organizations are saturated with images, pictures, and signs that impact on many different aspects of everyday organizational life. A moment of reflection can produce a long list of examples relating to: budgets and accounting tools, advertising literature, design specifications, public relations leaflets, standard operating procedures, schedules, reports, graphs, charts, organizational hierarchies, and maps, to name but a few. This raises the question of how we study the role of images in performing all kinds of activities that keep us busy and attentive? Do we focus on images as signs and inscriptions that can be viewed as mediators making others do things (Latour, 2005)? How does this relate to ideas of intensities, affect, engagement, beliefs and passions? Can we explore the difference and multiplicity that underlies such performances in terms of techniques and practices of managing and organizing, and how do images relate to various issues of agency, accountability and responsibility? Furthermore, imagination as representation is not the focus of this call. Rather than limiting the debate to the role that images have in representing ‘businesses’ of all sorts, we need to explore the role of images as 'forces' in performing business, and enabling possibilities in terms of thinking about and enacting particular orderings. While images, signs and visualization have been studied from a wide range of perspectives and fields of study (e.g. history, religious iconography, art and visual studies, literature and communication studies, philosophy, sociology, geography, visual anthropology, semiotics, architecture, science and technology studies), within the areas of business, management and organization studies the level of interest has been less evident. A particular focus of this workshop therefore involves bringing together an eclectic assembly of scholars to enable an imaginative forum for discussion and debate in this area of enquiry. We welcome papers and extended abstracts (2500–4000 words) from scholars from a wide range of disciplines that seek to explore theoretical and empirical issues from a diverse set of themes. Disappointing news for those in the business of promoting design and design management. The Economist's recent report on innovation has not paid attention to the evangelism of designers, academics, and national design bodies like the UK's Design Council who have been talking up the value of design processes and 'design thinking' in organizational life and in innovation in particular. The articles provide a good snapshot of some key ideas - the differences between innovation and invention, the role of creativity, national policy, and organizational implications. They run through some recent thinking including open innovation, disruptive innovation, user-led innovation and service innovation. IDEO's Tim Brown gets a quote, and Doblin's Larry Keeley. But design-led innovation doesn't get a mention. Where does this leave researchers working in this area - after 40 or so years of research into design processes and design theory, and 25+ years of research into design management? Responses welcome. 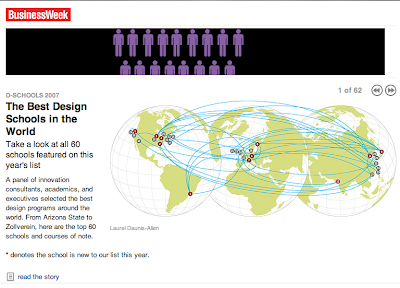 This year Said Business School has again made the list of top design schools around the world - one of few business schools to do so. Here's the special report. The full list is here, which includes many of the most prestigious names in design and engineering education. But as with last year a number of interdisciplinary initiatives and joint programmes has brought several business and management schools on to the list including the obvious contenders Stanford, Rotman, and Harvard. We're honoured to be included in the top 60 and the recognition it indicates for the work we've been doing in teaching and research. We think of the initiatives we currently have at Said as a prototype for a way of working that acknowledges the strengths and particularities of Oxford and its networks of entrepreuneurs, especially in science and technology. With my Said colleagues, in particular those working in innovation, operations management and marketing, we are now looking at how to build on our early work and iterate these ideas to make a sustainable and valuable contribution to management teaching and research. Design management is a discipline, or interdiscipline, in transition. A recent seminar held at London College of Communications brought together researchers, lecturers and practitioners who work within or on the boundaries of this area. The aim of the day was to create a platform to sustain further debate, analysis and action. Organized by Naomi Gornick (Brunel), Tom Inns (Dudee), Tony Kent (LCC) and others, the workshop involved this diverse group exploring definitions of design management, its relation to other bodies of knowledge and the value of connecting practice, education and research. Participants included those with a long-standing commitment to research and teaching in this area including Alan Topalian and Brigitte Borja. In discussions there were references back to key workshops and reports in the 1980s, the decade during which design management emerged - with an occasional suggestion that 'none of this is new'. Les Wynn's account of his role within Xerox raised some of the questions facing both design managers, and the discipline as a whole. Wynn asked how design management must change, given the changing business models facing many organizations to which outsourcing is a common response. Is design just another function of the organization or is it a key capability that should definitely stay in house? What came across strongly for me was how there continues to be a confusion between design, and design management. Participants discussed design management on both a project level and an organization level. They seemed to be agreement that design management was connected with strategy, and that its visibility and accountability to the highest level of the organization is key to its effectiveness. I would not expect to see design management emerge as a single, authorizing discipline to build on this earlier history. Rather I notice a number of areas in which the ideas of both design and design management have been taken into conversations about strategy, innovation and organizational design - in the approaches discussed in Boland and Collopy's Managing as Designing, for example, the founding of the d-School at Stanford, the MBA at the Zollverein School of Management and Design and the establishment of Design London (Imperial College, Tanaka Business School and the Royal College of Art). In this diverse and diversifying area of practice and research, I suspect design management is likely to remain fluid. Workshops such as this one will have an important role in bringing together some of that diversity.